The mine surveyor is one of the most important, yet under rated engineering professionals at a mine site. Compared to other engineers on site they tend to be overshadowed, despite being responsible for such important everyday tasks as 3D mapping of stockpiles and mine excavations, and the monitoring of mine extraction processes. These tasks are not only time consuming, but also dangerous, and if done incorrectly could see the mine suffer from a highwall failure or roof collapse. Using traditional surveying methods such as scanners to create point clouds is protracted, while photogrammic techniques are nearly impossible in heavy cloud or poor weather. Another method is needed – and unmanned aerial vehicles are providing it. 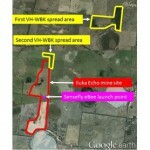 To date they have already seen service at mines in Queensland and Western Australia. According to Gatewing the demand for faster data and safer acquisition methods is driving the use of machines such as its Gatewing X100, which provides an alternative to traditional surveying methods. The machine itself is a light, unmanned aircraft with an onboard, high resolution ten megapixel calibrated camera that captures overlapping images to provide a five centimetre pixel resolution with comparable X, Y, and Z accuracy when flying at heights of up to 150 metres. Currently most UAVs or 'drones' are operated by a line of sight controller beneath 125 metres. The strength of UAV systems over traditional methods is the fact that the flights are conducted in a fully automated manner from its launch until landing. For vehicles such as the X100, no piloting skills are needed, and all the worker has to do is simply facilitate the aircraft's operation, which includes outlining the area to be mapped and selecting a take-off and landing spot on a ground control station. Helicopter UAVs have also been used to map stockpiles and can cover an area of 25 hectares within half an hour, providing a ground pixel size of under four centimetres as well as a height accuracy of under four centimetres. Planning the area that needs to be scanned is fairly straightforward, and a number of companies have software designed for the project. Gatewing has scanning software called Quickfield while another Australian company, Adam Technology, has created the 3DM analyst software which has been used successfully in Australia to survey stockpiles. The mission planning can be carried out either on or off site, or anywhere there is an internet connection. To actually run the UAV the mission simply has to be opened onsite, a few key parameters such as wind direction and speed, flying height, overlap areas, and the like need to be inputted, then an operator simply launches the aircraft and sits back while it covers the pre-defined area. According to Gatewing, in the case of the X100 it carries parallel sweeps following a regular shape and takes hi-res photos at a rate of about 40 per minute with a high overlap. Once the pre-defined area has been covered the UAV descends to about 75 metres in height after which it begins its landing procedures, finally belly landings at a prearranged spot. "As the X100 has no landing gear but is designed to land on its belly it allows the UAV to land in very rough terrain." However "after around 50 flights (depending on the roughness of the terrain) its wings will start to wear out. "But when buying the X100 it does come with a second set of wings, and importantly these wings are easily replaceable and relatively low cost (coming in at less then five per cent of the cost of the system)." To ready it for the next flight just replace the pre-loaded eBox – the brain of the system, the camera, and the battery and it's ready to fly again. It is mostly autonomous once in the air, with the ground control station only used to monitor the flight, allow an onsite image quality check, and to intervene if necessary. For example if a helicopter or other flying object is close you can simply circle the UAV at its current location, recall it, or make it land immediately. Mapping aside, UAVs have also been highlighted for their ability to carry out urgent deliveries of small items. UAV Australia managing director Aonghus Stevens said "you could use a drone to carry something up to 30 kilograms, and have a critical spare part delivered to an LNG rig or a mine," he said. "It reduces cost and has a quicker turnaround (than a helicopter courier)." Gatewing says its X100 unmanned aerial vehicles are made from expanded polypropylene and reinforced with a carbon frame, and are designed for the rough conditions found in the industry. It weighs only 2 kilograms and has a wingspan of one metre. Because of its lightweight material and built-in failsafe procedures "the X100 is one of the safest unmanned aircrafts on the market," the company claims. In addition to these failsafe programs, the systems have been built to ensure that the survey crews no longer have to clamber over stockpiles, around highwalls, or embark on or near hazardous machines as surfaces are remotely sensed by the UAVs and the surveyor can now simply monitor its progress from a safe place nearby. The company went on to say that the X100 is able to cover several kilometres on a single battery and can operate in a number of different weather conditions. "The device operates in hot, cold, drizzly, and blustery conditions, working where there are wind speeds of up to 50 kilometres per hour. "Compared to the traditional photogrammery techniques this is a major benefits because with the traditional methods it's often not possible to obtain imagery because of cloud weather, whereas with UAVs they can take images below the clouds."